Beer School: Adjunction Junction, What's Your Function - Captain Lawrence Brewing Co.
Beer School: Adjunction Junction, What’s Your Function? Do they really dump hundreds of pounds of pumpkins in pumpkin ales? Why are they putting lactose into my beer? Is a beer with fruit in it still a beer? Brewers have been adding unique ingredients to beers for centuries and it’s becoming even more popular in the American craft beer market. Adjunction Junction will explore the use of ingredients other than water, malt, hops and yeast in brewing. From classic styles to new hybrids, we’ll talk about these adjuncts and how they can bring beer to a new level. Beer school is in session and you’re all invited. Join us as we explore a number of brewing and beer topics while we enjoy some of the best beers that Captain Lawrence has to offer. 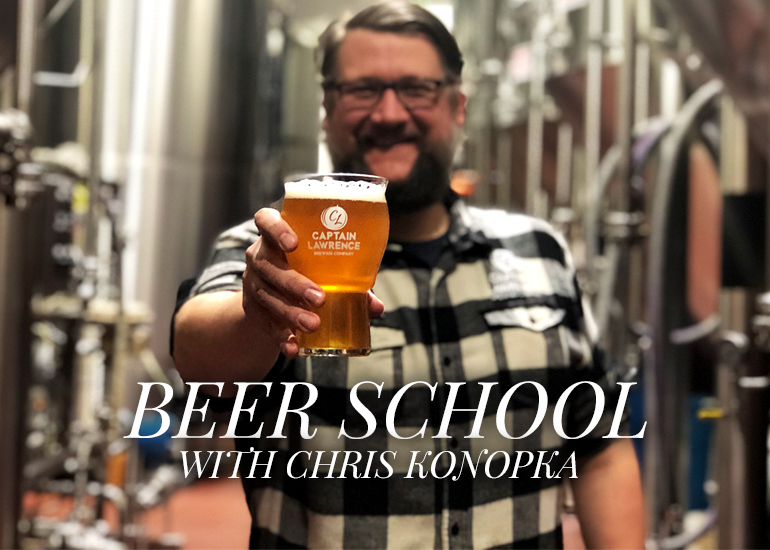 Perfect for the craft beer novice or longtime enthusiast looking to learn more, these classes will offer a taste of what craft beer has to offer and help you make an informed decision about what you’re putting into your glass. Hang out with fellow beer lovers, discuss all things beer, savor beers brewed just steps away and impress your friends and family with your newfound craft beer savvy.